Happy Friday! Yesterday I made the drive down to Austin for a quick 24-hour trip to film a style segment for Studio 512 on KXAN this morning! If you’re in Austin, tune in or record the show at 12:30pm central time TODAY to see me and a real-life At Any Age feature! Now that I’m back in Texas from my California trip, I’m having to adjust my weather expectations. It’s back to rainy, dreary weather here, which has me reaching for my favorite black basics and trench coats. This baby blue piece (sold out – very similar one here!) is a new one I snagged while visiting Timo Weiland in his New York studio earlier this month. If you aren’t already familiar with Timo and his collection, get acquainted ASAP. Not only are his pieces exquisite, he’s just the nicest southern gentleman I’ve met in the fashion industry. If I lived in New York, I know we’d be besties. With the temps being so up and down, and with it being so humid with all this rain, it’s nice to have an elevated topper like this trench to add a luxe look to even my most basic outfits. Next time I pull this trench out, I’m going to wear it as a dress. So chic, no? love this outfit and good luck on filming today. 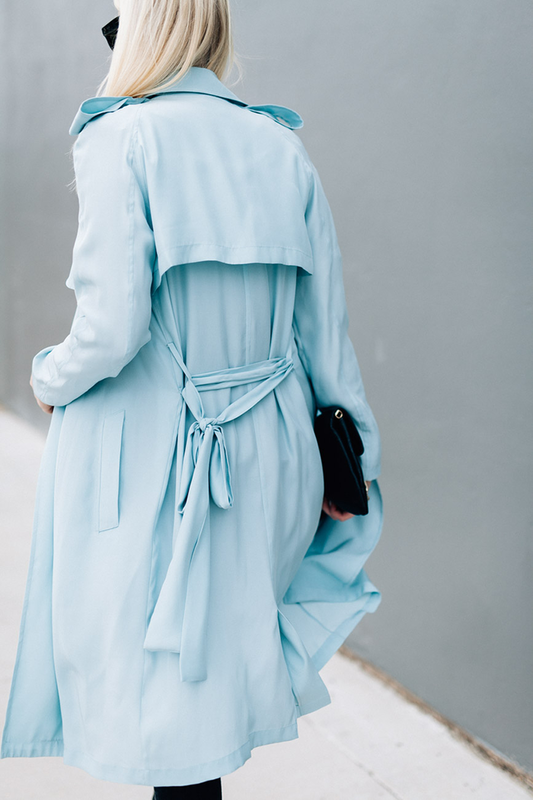 Ooh the color of this trench is gorgeous – I’m such a sucker for pastels! Gorgeous coat! 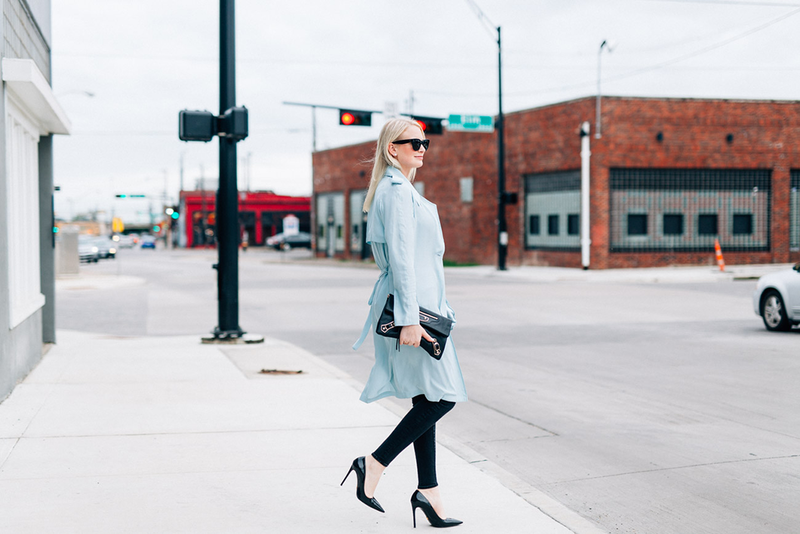 I love the baby blue paired with black… So chic! Congrats on the style segment!! Happy Friday! Congrats on the segment…very well deserved. This sky blue looks gorgeous on you, and I’m loving it paired with all black. The trench as a dress sounds like an amazing idea! Have a great Friday! Awesome! That blue looks divine on you. That trench is beautiful and pairs perfectly with the black basics. Super chic trench! Great outfit Merritt! Such great photos and an amazing color! You look beautiful. Have a great weekend, Merritt! Such a pretty look! 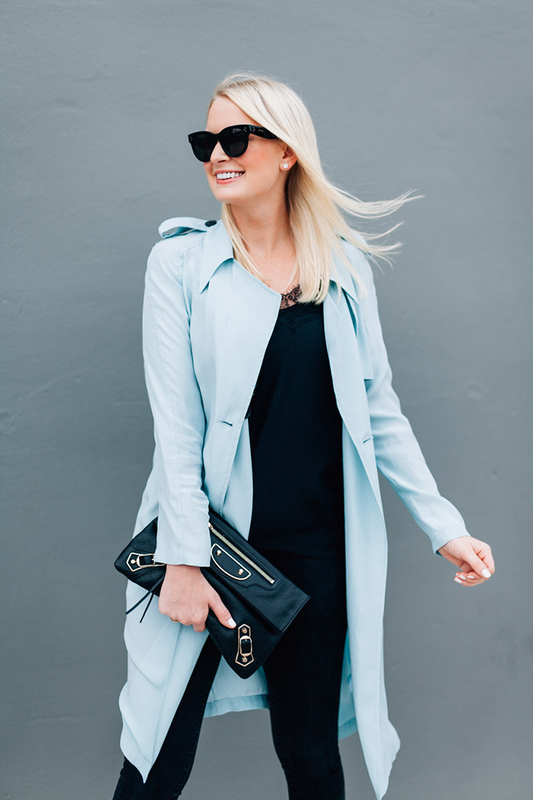 Love your trench! I love this casual look, the trench is perfect! What a gorgeous trench coat! It pairs perfectly with your black. You look gorgeous. Such a gorgeous color, perfect for these months! that blue color is amazing! IN LOVE! !